A recipe for chaos? That’s the Neo-Futurists. 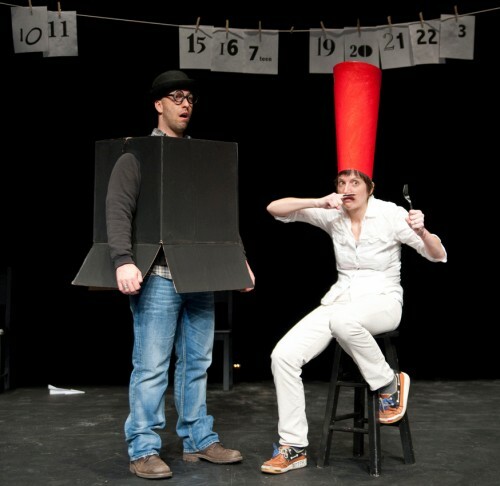 Touring from Chicago to Woolly Mammoth with two casts (members only perform their own works) – Eliza Burmester, Bilal Dardai, Mary Fons-Misetic, Chloe Johnston, and Jay Torrence until December 19, then John Pierson and Kristie Vuocolo swapping in for Burmester and Johnston – no audience will ever see the same production twice. This isn’t the most amazing night of high-caliber theater you’ll ever see. What it is, most definitely, is a wicked experiment in post-modernism launching actors over some pretty steep hurdles. You want them to succeed, their earnestness and honesty stripped bare of fancy production values, bits of their life stories both painful and hilarious paraded before you. The pieces veer wildly from the downright goofy to spot-on political skewering alternating with cringing naivete. Again, you are not going to see the same plays as I in the same order so it’s pointless for me to highlight anything in particular (though I really want to… ok – “Illegal Abortion Play” where the guy rips down the number with a hanger and the audience writhes uneasily? now that’s post-modernism! “A Theater Major’s Revenge” where the actor just looks out at the audience and says “I still have a job.” priceless). Originally created by Greg Allen back in 1988, the production still maintains the dedication to political and social consciousness while being rooted in Dada and Surrealism (witness the photo above, from “A Dada Treatise on the Parking Meter Situation in the City of Chicago”). There were more hits than misses the night I saw it (December 9), but even when they veered off too far into earnest political correctness land you couldn’t really fault the sentiment considering the dedication of the performers. It’s a crazy night of absurdist theater that will never repeat itself, perfectly highlighting the ephemeral nature of live performance. The actors push down the fourth wall and invite you in, bravely. In a few cases, they may actually invite you up. Be brave yourself. Postmodernism is dead. Digimodernism succeeded it.